"One of the creative and industrial hubs of the city. Amidst all of this creation, there sits a cozy little cafe where the staff love to chat up the locals and first-timers." JJ Bean Coffee Roasters' Railway bakery cafe is unique for the simple fact that most people probably have no idea that it exists. Located in the northern end of Strathcona, the area has been transformed from it's industrial roots to a home for artists, fashion designers and interior design showrooms. 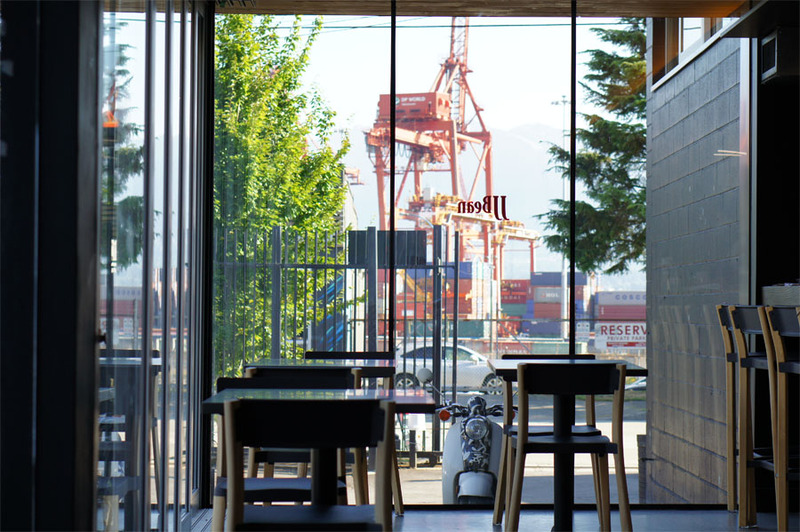 Housed in a dark gray cinder block building the cafe includes a small addition at the front providing seating with floor to ceiling glass panels that includes a nice view of the Centerm container terminal and its massive red gantry cranes. Like other JJ Bean cafes the space is accented by natural woods from the beams in the ceiling to the JJ Bean sign out front. There are no surprises with the coffee with brewed coffee and espresso drinks served from their stainless steel La Marzocco along with a selection of their JJ Leaf Teas: black teas, green teas and herbal infusions. The location also serves as JJ Bean's commissary making sandwiches and wraps for their cafes while baked goods get prepared onsite at each of their cafes. And with a full production kitchen, the cafe is also unique from other JJ Bean cafes making soups, salads and other specials for lunch. While not located in a heritage building, JJ Bean's Railway Street cafe is surround by Vancouver's history starting with the Hastings Mill that opened at the foot of Dunlevy Avenue in 1867 and then the decision to select Vancouver for the Canadian Pacific Railroad terminus in 1885. Railway Street was named after the CPR line and looking at a map you can also see the road follows the curve of the CPR trunk line. While not an official name for the neighbourhood, Railtown is located on the north side of Strathcona in the Downtown Eastside. Coined by neighbourhood businesses as the "Railtown Design District" the area also sits near the old home of Vancouver's Japantown that was centered along Powell Street. "Named after the East Van neighbourhood that's home to our bakery café, Railtown is our darkest blend. We roast the Railtown dark enough to minimize acidity and bring out the full body and "roasty" character that dark drinkers enjoy." The area also was home to a number of companies taking advantage of the growing West coast fishery. In 1910, the New England Fish Company/Canadian Fishing Company opened a cold storage and ice-making operation and later a cannery at the foot of Gore Avenue. In 1925 the American Can Company built their offices at 611 Alexander Street which produced tin cans for the canneries in British Columbia as well as for a number of other products like coffee, milk and vegetables. The building now houses students from the Simon Fraser University School of Contemporary Design, fashion designers and architects including DIALOG which has designed almost all of JJ Bean's cafes. Across the street from the cafe is the design office of Endeavor Snowboards and in the process of making their snowboards they've collaborated with artists around the world. One of these collaborations led to a commission from Endeavor to create a mural on the side of their building by Melbourne-based street artist Dave "Meggs" Hooke. They have a film with the story of the mural creation. JJ Bean founder and owner John Neate was interviewed by the Vancouver Courier in May 2009 and mentioned the bakery cafe was originally envisioned for somewhere on 2nd Avenue between Cambie and Main but the location was passed up due to the light industrial zoning. However, the area will soon house a JJ Bean cafe inside the Wall Centre False Creek development at the Olympic Village. The red patio chairs at the cafe are Sail chairs from Andreu World and designed by Piergiorgio Cazzaniga. Made of thermo-polymer there are also versions made from oak wood and upholstered in cuero leather.